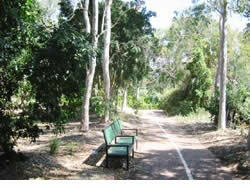 Walking is free and the Kershaw Gardens in Rockhampton provides a variety of interesting walks. 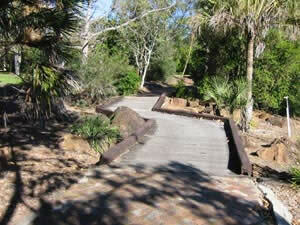 Walkways are clearly marked; while some are paved others are sealed or just a plain scrub track. There is no night time lighting. 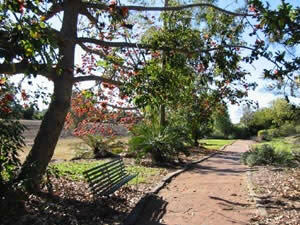 Spring is a good time to see the different Australian flowering trees and shrubs. 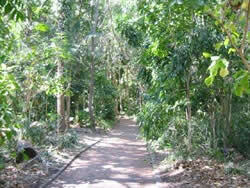 Wear a hat, 15+ sunscreen, take a water bottle and make sure your dog is on a leash. 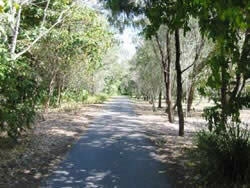 Photos on this web page will change by just rolling your mouse over the photo and waiting for the change. ADSL connections should be quick to change while 56k dial up will need more time.